This non-irritating mineral based sun screen is gentle enough to be used on sensitive skin and protects skin from broad spectrum SPF50+PA++++ UV A&B rays that delivers anti-aging and whitening benefits. It's formulated with potent antioxidans of cold-slow brewed super 7 complex and Ylang Ylang Oil which detoxifies and soothes blemishes, and helps prevent future breakouts. 1) At the end of your skincare routine, take a suitable amount and spread evenly across your face. neck or wherever needed. 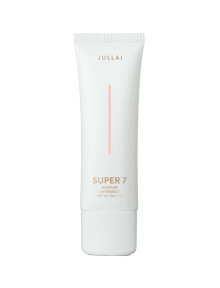 Jullai is a South Korean cosmetic brand. The brand philosophy of the brand is focused not only on the skin but also environment and lifestyle. The name Jullai is a mix of two words July and Lai. July as a month is a month full of energy - even if you look at nature, its full of green and vivid colours. Lai is a name of a poetic form which was popular in France during the 13th and 14th centuries. This form praises love and nature. Jullai mixes natural ingredients - called superfood since they are told to have more power - and cold-slow brow method which is a method that can not only help in saving the power of the natural ingredients but also minimalizes energy consumption. The brand has two lines - Super 12 and Super 7 - both are based on the complex made out of superfoods.